This is a syndrome that occurs following blood clot in the vein (DVT). It could occur weeks or months after DVT resulting in pain, swelling, redness and shiny skin. An ulcer can form months after DVT has been present for a long period of time. It is also called post-thrombotic syndrome (PTS) and Chronic Venous Insufficiency (CVI). PTS affects 23-60% of the patients within two years of DVT. 10% may go on to developing severe PTS and venous ulcers. It is estimated that about 2-5% of the entire population suffers from CVI. The peak incidence in women is 40-49 years while in men it is 70-79 years. The swelling in the affected leg is increased after standing or sitting for long period of time. One must differentiate between postphlebitic syndrome and the formation of fresh clot in the leg. This is done by colour Doppler study. In normal legs when we walk the calf muscles reduce the venous pressure by 70% which returns to normal within 30 seconds of resting. However in diseased veins the reduction of pressure when we walk is only 20% and takes minutes to return to normal when resting. The exact cause is not known though it is considered that inflammation cause due to the clot destroys the valves causing incompetence. Various theories have been postulated. Venous hypertension along with venous obstruction leads to increased venous and capillary pressure causing subcutaneous haemorrhage and increased tissue permeability leading to oedema, pain, discolouration and ulcers. The blood clot in the vein interferes with the blood flow from the site of blockage to the heart. It causes injury to the vein lining and to the valves causing permanent damage. The pooling of the blood is responsible for the swelling and the pain in the leg. The larger the clot and the longer it is present before treatment, the more severe the post-phlebitic syndrome. Leg discomfort is due to venous hypertension and is responsible for pain, heaviness, itching and burning in the affected calf and leg. Swelling, Varicose veins – depict venous hypertension which will lead to CVI. Dermatosclerosis – Brownish discolouration of the skin around the ankle.Non- healing ulcers.These symptoms worsen on standing or walking and improve on lying and elevating the legs. PTS worsens the quality of life of the patient and interferes with his daily activity. The socio-economic impact is tremendous and PTS also adds significantly to the cost of treating DVT which in the US is estimated at over $ 200 million and over 2 million work days are lost every year. A second DVT in the same leg as the first. Persistant DVT one month after the diagnosis. Poor anticoagulation control (low dose) during the first 3 months of DVT. Though post-phlebitic syndrome may be difficult to treat, in time the swelling could be brought to near normal. Patient has to wear graded elastic stockings before getting out of bed in the morning and removed before sleeping at night. If the job involves much standing then elevate legs at scheduled times as often as possible. If the job involves sitting for long then elevate the leg which will reduce the swelling. Besides this there are electro-stimulation devices and care of the wound ulcers. 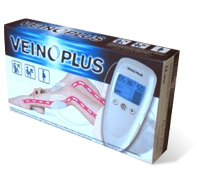 The electro-stimulation devices are veinoplus which stimulates the calf muscles promoting venous return, preventing reflux and thus reducing oedema. This begins with preventing the initial and recurrent DVT. For high risk hospitalized patients ambulation, stockings, leg elevation, electrostimulation devices and/or anticoagulation. For those who have already had DVT the best way to prevent second DVT is by appropriate anticoagulation therapy. Weight loss for the obese is a way of prevention of DVT. Some data suggest that post-DVT compression stockings for 2 years prevents PTS. The signs and symptoms for DVT and PTS are quite similar so we wait for 3-6 months after DVT before an appropriate diagnosis of PTS is made. This is also present but incidence is lower than the leg (15 – 25%). There is no established treatment except compression sleeve for persistent symptoms. The exact pathophysiology has not been defined as yet – including role of inflammation and residual thrombus even after anticoagulation therapy. Role of thrombolysis in PTS prevention. Defining the true efficacy of compression stockings in PTS and if effective what is the compression strength necessary, when to wear stockings and for how long. Does PTS need more unidentified methods for treatment than those for DVT. Why do we get PTS? Piulacks said that AV fistulas in the skin of the leg caused hypoxia causing changes in skin and the tissue. Burnard postulated the fibrin cuff theory – venous hypertension causes leakage of the plasma proteins mainly fibrinogen which encircles the affected capillaries reducing oxygen to the surrounding tissue. Coleridge-Smith white cell trapping theory – venous hypertension and resultant increased capillary pressure trap the WBC in capillaries, where they become active and damage the capillary bed. The resulting increased permeability leads to seepage of plasma proteins and fibrinogen which forms a fibrin cuff around the capillaries thus decreasing the oxygen to the surrounding tissue. Venous hypertension in diseased veins is thought to cause CVI by the following sequence of events. 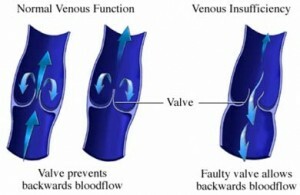 Increased venous pressure transcends the venules to the capillaries, impeding flow. Low-flow states within the capillaries cause leukocyte trapping. Trapped leukocytes release proteolytic enzymes and oxygen free radicals, which damage capillary basement membranes. Plasma proteins, such as fibrinogen, leak into the surrounding tissues, forming a fibrin cuff. Interstitial fibrin and resultant edema decrease oxygen delivery to the tissues, resulting in local hypoxia. Inflammation and tissue loss result.